I will typically include only one translation of the given passage for each study, but in this case, to show some of the main differences that are found in this letter, I am going to show both the NABRE and RSV-CE for this instance. Paul and Timothy, slaves of Christ Jesus, to all the holy ones in Christ Jesus who are in Philippi, with the overseers and ministers: 2 grace to you and peace from God our Father and the Lord Jesus Christ. Thanksgiving.3 I give thanks to my God at every remembrance of you, 4 praying always with joy in my every prayer for all of you, 5 because of your partnership for the gospel from the first day until now. 6 I am confident of this, that the one who began a good work in you will continue to complete it until the day of Christ Jesus. 7 It is right that I should think this way about all of you, because I hold you in my heart, you who are all partners with me in grace, both in my imprisonment and in the defense and confirmation of the gospel. 8 For God is my witness, how I long for all of you with the affection of Christ Jesus. 9 And this is my prayer: that your love may increase ever more and more in knowledge and every kind of perception, 10 to discern what is of value, so that you may be pure and blameless for the day of Christ, 11 filled with the fruit of righteousness that comes through Jesus Christ for the glory and praise of God (NABRE). Paul and Timothy, servants of Christ Jesus, To all the saints in Christ Jesus who are at Philip'pi, with the bishops and deacons: 2 Grace to you and peace from God our Father and the Lord Jesus Christ. 3 I thank my God in all my remembrance of you, 4 always in every prayer of mine for you all making my prayer with joy, 5 thankful for your partnership in the gospel from the first day until now. 6 And I am sure that he who began a good work in you will bring it to completion at the day of Jesus Christ. 7 It is right for me to feel thus about you all, because I hold you in my heart, for you are all partakers with me of grace, both in my imprisonment and in the defense and confirmation of the gospel. 8 For God is my witness, how I yearn for you all with the affection of Christ Jesus. 9 And it is my prayer that your love may abound more and more, with knowledge and all discernment, 10 so that you may approve what is excellent, and may be pure and blameless for the day of Christ, 11 filled with the fruits of righteousness which come through Jesus Christ, to the glory and praise of God (RSV-CE). As with many of his letters, minus Galatians, Paul begins Philippians with a greeting and prayer of thanksgiving. We see here a standard opening of Paul, though with a few twists. First off, my namesake, Timothy, is mentioned at the beginning, although it is clear that Paul is the primary writer of this letter with his use of "I" throughout. Timothy joined Paul, after Paul's parting-of-ways with Barnabas, just before the mission to Philippi. You can read about this at the beginning of Acts 16. Of note, verse one proves to be interesting because it shows four significant differences between the NABRE and RSV. In the beginning of verse one, the NABRE goes with "slaves" instead of the RSV's "servants", while in the second half of that verse the NABRE goes with "holy ones", "overseers" and "ministers", instead of the RSV's "saints", "bishops", and "deacons". In the first case, concerning the Greek word doulos, I actually prefer the NABRE's decision to go with "slave". As the NABRE note in Romans 1:1 points out: "Paul applies the term slave to himself in order to express his undivided allegiance to the Lord of the church, the Master of all, including slaves and masters. "No one can serve (i.e., be a slave to) two masters," said Jesus (Mt. 6:24). It is this aspect of the slave-master relationship rather than its degrading implications that Paul emphasises when he discusses Christian commitment." However, I can certainly understand, nowadays, why some translators go with 'servant". The second half of the verse I tend to prefer the all of RSV's rendering. The Greek term hagios can be either options, and I certainly understand the translators of the NABRE not wanting to confuse readers in regards to canonized saints, but historically it has always been rendered as "saints". Also, are we not called to strive for sainthood while here on earth? I think a footnote would have been sufficient to explain this. "Overseers: the Greek term episkopos literally means “one who oversees” or “one who supervises,” but since the second century it has come to designate the “bishop,” the official who heads a local church. In New Testament times this office had not yet developed into the form that it later assumed, though it seems to be well on the way to such development in the Pastorals; see 1 Tm 3:2 and Ti 1:7, where it is translated bishop. 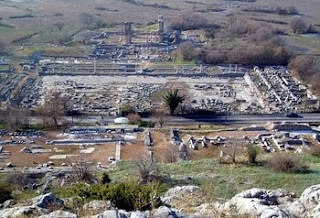 At Philippi, however (and at Ephesus, according to Acts 20:28), there was more than one episkopos, and the precise function of these officials is uncertain. In order to distinguish this office from the later stages into which it developed, the term is here translated as overseers. While it seems likely that the development of the office of bishop was still in its infancy, a point that is made in both the Navarre and ICSBNT as well, is it not better to be consistent in translating it as either "bishops" or "overseers" throughout? In any case, we do see that, even before the writing of the Pastoral Letters, the local churches have some kind of hierarchical structure (Navarre 499). The same thing goes for the office of deacon, although there are some more complicated issues regarding diakonoi which may be a bit too much to get into at this point. Finally, Paul concludes, in verse 2, with "Grace to you and peace from God our Father and the Lord Jesus Christ." We see here, not only a pretty standard Pauline greeting, but more importantly an important Christological statement. Grace and peace do not come simply from the Father, but also the Lord Jesus Christ, second Person of the Blessed Trinity. This will make more sense, once we look at the great Christ-hymn of 2:6-11. In my introduction to this series, I mentioned that of all Paul's letters, this one probably shows the most joy and affection. As the Navarre Compact New Testament confirms, these opening verses show "more vividly than any other, St. Paul's affection and appreciation for the Christians of those communities he founded (Navarre 499)." In many ways, this could be described as an epistle of joy. In verses 3-11 we find that Paul is joyful, thankful, holding in his heart, and yearning with affection for the Philippian church. (Could this be the anti-Galatians epistle?) It should be remembered that Paul wrote this letter while imprisoned, so you can imagine how uplifting it would be for him to be able to communicate with this thriving, yet young, Philippian church which he founded in Christ Jesus. Yet, even with this sense of joy, there is an underlying sense of urgency, particularly when Paul mentions "the Day of Jesus Christ" in verses 6 and 10. While Paul recognizes the sanctity of the Philippian church, he also knows that they need to continue to grow spiritually. This is most clear in verses 9-10: "And it is my prayer that your love may abound more and more, with knowledge and all discernment, so that you may approve what is excellent, and may be pure and blameless for the day of Christ." Here, and in verse 6, Paul reminds them to cooperate with the graces that God is giving them, so that they will attain salvation. Here, we see echoes of what Paul will later say in 2:12-13, where he urges the Philippians to "work out your salvation with fear and trembling, for God is at work in you, both to will and to work for his good pleasure." Next time, we will look at chapter 1, verses 12-26. Personally I prefer RSV-CE to NABRE. On the other hand douloi translated as slaves is not only closer to original but carries special significance when one considers that Paul was not only a free man but also a Roman citizen and was addressing Philippians who had special status within the system of imperial administration (e.g. tax exemptions). Interestingly Paul directly names himself slave of Christ only here. It calls to mind John the Baptist: he [Christ] who is coming after me is mightier than I, whose sandals I am not worthy to carry (Matt 3:11) which was derogatory in Semitic culture so even slaves were exempted from carrying their masters' sandals. So Paul becomes like his Master who also: emptied himself, taking the form of a servant [doulo = slave] (Phil 2:7). Compare also Christ washing feet of his Apostles. He who was free when called is a slave of Christ (1 Cor 7:22). Indeed Paul was enslaved on his way to Damascus. I consider the textual notes of a translation to be an integral part of the translation. I know that the publishers of the NAB require their notes to be published with their editions; and the NRSV has a similar requirement. The NOAB-RSV (which in some ways is a semi-official annotated edition of the RSV) has short but useful notes here. At "bishops and deacons" it mentions "i.e. 'overseers' and 'assistants'" and suggests a comparison with 1 Corinthian 12:28. That is, in fact, a pretty useful cross-reference. In contrast, the NAB falls short in cross references. It suggests looking at Romans 1:1, 2 Corinthian 1:1, and 1 Thessalonians 1:1, all of which alternative opening Pauline salutations (but don't clarify the "overseers and ministers.") The final cross reference is 1 Timothy 3:1-13 which discusses the requirements of bishops and deacons. Here, as you note in your post, a different terminology is used. If you dig into the NAB's notes, you can find a reference at 1 Timothy 3:1 equating "bishop" with "overseer" but there is no similar note at "deacon." If you look at 1 Corinthian 12:28 in the NAB, you won't find anything to relate it to Philippians 1:1. My point here is that when one considers the notes, the RSV, NRSV, and NOAB-RSV all manage to pack the alternative meanings of the terms, and they manage to do it much more concisely than the NAB does. If one is reading aloud (and skipping the notes) this may not be relevant, but if one is following along with the textual notes, the RSV, NRSV, and NOAB-RSV all manage to express the key information, and they do it without being as distracting as the NABRE's rather lengthy notes. If one considers the notes as part of the text, the RSV (and NRSV) seem to exceed the NAB in terms of quality of translation of verse 1:1. I'm struck by how different Bibles explain the role of "ἐπισκόποις" and "διακόνοις" in the early/Pauline churches. The NABRE mentions the fact that here St. Paul uses a plural form of the words. While we're used to having many deacons in a town, that there are many bishops seems a bit odd to us. ... there is no evidence, of such overseers in the early Jewish-Christian church in Palestine; episkopoi first appear in the Gentile Christian communities established by Paul... The bishops... could correspond to the elders of, e.g. the Jerusalem church. The CCB does connect presbyters to "supervisors", by claiming that these supervisors must have become the leaders of a council of presbyters and makes clear that the bishops St. Paul is writing to are not like the bishops of today. The HarperCollins Study Bible is much more circumspect and says, "The precise meaning of bishops and deacons cannot be determined, except that they were leaders of the Philippian church." The fact that the HCSB is more "risk-averse" than the NABRE, AB, and CCB when it comes to explaining Phil 1:1 is genuinely surprising to me. Shouldn't it be the other way around? I'd expect the college textbook to make note of the fact that the words don't mean quite what the reader is going to think they mean. I almost get the impression that Philippi was some sort of hub for St. Paul's Greek and Anatolian churches - the fact that the "bishops and deacons"/"overseers and servants" are with the "saints"/"holy ones" seems to tell me that their presence together is somehow out of the ordinary or provisional.